Tulip Time Festival (www.tuliptime.com) is pleased to announce Lisa Schulist and her klompen, In Full Bloom, as the winner of Klompen Garden, a brand new art project celebrating the 90th Tulip Time Festival. The announcement was made Thursday evening at an artist reception held at the Saugatuck Center for the Arts. It started in a brainstorming session. Then, a seed was planted. And now, 45 pairs of artfully designed large ‘wooden’ shoes will soon be ‘growing’ in city parks and tulip beds throughout the downtown Holland area! Artists living in Ottawa, Allegan, Kent, Muskegon and Kalamazoo counties were invited to submit a design concept for this one-of-a-kind art project. Of those submitted, 45 were selected. The artists received a large pair (34”L x 12”W x 12”H) of ‘wooden’ shoes, to bring their concept to life. On Thursday, April 11, Kristin Armstrong, Executive Director of the Saugatuck Center for the Arts, selected the’ juror’s pick’ which was awarded a grand prize of $1,000. The winning artist is Lisa Schulist with her klompen In Full Bloom. Kristin commented on her thought process in making this selection. “I think the design and use of color is very well done. I also see it as representing inclusion and diversity – you don’t have to be Dutch to celebrate Dutch heritage. Our community is made up of people from all different backgrounds who come together to celebrate Tulip Time.” The winning klompen will be on display in the lobby of the Holland Civic Center during the festival. 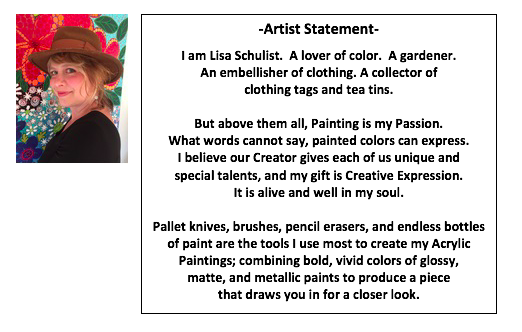 Winning artist, Schulist, is a painter, a lover of color and a gardener. She uses pallet knives, pencil erasers and endless bottles of paint to create her acrylic paintings. She combines bold, vivid colors of glossy, matte and metallic paints to produce a piece that draws the viewer in for a closer look. Schulist happily resides in Holland with her husband, Martin. Together they have four grown children. The remaining 44 pairs will compete for People’s Choice Awards. The public can vote for their favorites between May 1 – 11, 2019. The top three public picks will be announced on May 12. Of the public votes, first place will be awarded $500, second place will be awarded $300 and third place will be awarded $200. See if you can find all 45 klompen around town! A ‘Hunt and Find’ activity map will be available soon at www.tuliptime.com/klompen-garden. How to vote: You can vote via Facebook by ‘liking’ the original image of your favorite artwork on the Tulip Time Facebook page. Each like is one vote. You can also vote for your favorites by visiting www.hollandsentinel.com/contests, where you can vote one time, per day, per device. Delaney Ann Prins Piet Mondrian goes Orange! Priscilla Walsh Orange you going to dance? Interested in supporting this public art project for the 90th Tulip Time Festival? Businesses, organizations and individuals can support Klompen Garden for a donation of $1,000. Donors will receive recognition on Klompen Garden collateral and will take home a pair of completed klompen after the festival. For additional details, contact Elizabeth Wallace at elizabeth@tuliptime.com or 616.396.4221 x104. Follow this project now through the festival by using #klompengarden! Join the dance as we “paint the town orange” at Tulip Time’s 90th Anniversary celebration May 4-12, 2019. Detailed program and event information for Tulip Time 2019 is available on www.tuliptime.com. Tickets for all shows can be purchased online at www.tuliptime.com, in person at the Tulip Time Festival Box Office located at 42 West 8th Street, Holland, Michigan, or by phone at 800-822-2770. Six years ago, I created a program of weekly art workshops called ‘Art Makes Change’ for individuals who have been incarcerated and/or involved in an addiction recovery program. It wasn’t long before word spread, soon others who were looking to be involved in a creative effort within the Holland community joined in. The workshops have brought people together, giving them time to connect and share, using art as a way of enjoying their new found sobriety and freedom. I happily reside in Holland with my husband, Martin; between us we have four grown children. When I’m not working, my days are easily filled creating art, making jewelry out of tea tins, and decorating. Together, Martin and I enjoy being with family, gardening, camping, music festivals, and eating delicious food! Offering painting & other unique craft parties for your church group, family, club, or team building event!